She fights alongside the men and she has earned her right to wear the bright USAF logo. The Air Force Silver Logo Womens V-Neck is sure to be a treasured gift when she is looking for something comfortable and proud to wear. Ladies can now fall in line and start their day with PT like the men with the Green Army Womens T-Shirt. Comfortable and a great way to show you support for anyone in the armed forces this shirt is ready to finish your look. Ladies fall in line and show off your fashion sense with the Grey U.S. Army Womens V-Neck shirt. 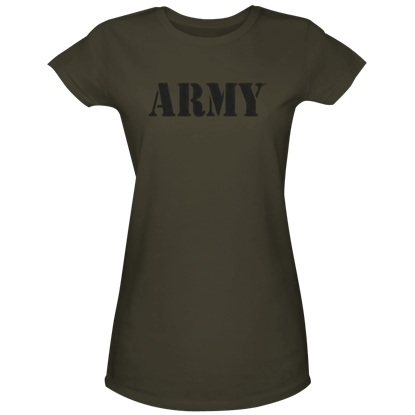 You do not have to sacrifice style, comfort, or function with this versatile shirt that boasts the proud ARMY name on it. 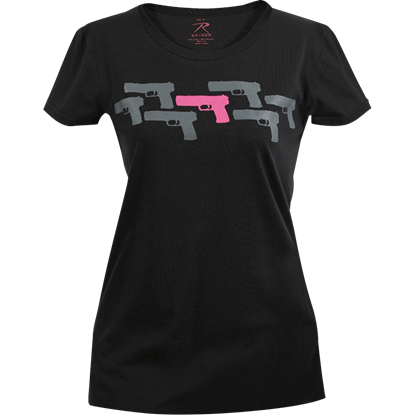 Today you can find ladies that appreciate firearms as much as any guy and the Womens Pink Pistol T-shirt is a prime example of that. This daring and stylish clothing item will allow your girl to show off her love of handguns.